When a tooth is damaged, it will most likely need one of two restorative dentistry treatments: a crown or a filling. Which we use will depend upon the extent and type of damage. Fillings are typically used to restore a tooth when you have a cavity that has affected less than 50% of your tooth. Crowns are used in response to a number of problems, including very large cavities, broken teeth, or even missing teeth. With porcelain for crowns and tooth-colored composite resin for fillings, we can provide you with metal-free dentistry and a more pleasing look. When you’ve got a cavity, a crack, or a fracture of a tooth, we can use a tooth-colored composite resin material to fix the problem. While we do still use silver amalgam for some situations, most of the fillings we provide at our Freedom dental office near Kaukauna are composite resin fillings. Why? These popular dental restorations blend in with your natural smile to produce a completely white smile. While metal fillings leave dark spots on your teeth that people might notice, no one will know you’ve had tooth-colored composite fillings done. Tooth-colored composite resin can bring your damaged tooth back to life. The dentist will numb your tooth, then remove any decay. He or she will then make sure the tooth is thoroughly cleansed, and the composite resin material will be placed in the cavity. The filling is polished, and you’re ready to go. A filling procedure only takes one appointment in most cases. Sometimes composite resin is used to fix chips or cracks that have been caused by problems other than decay, and composite resin can also be used to fix cosmetic problems like small gaps between teeth. In cases such as these, a crown goes over the damaged or decayed tooth. The crown is made to look and function just like a real tooth, complete with crevices along the chewing surface. Crowns can also help when replacing missing teeth, either as anchors for a fixed bridge or as restorations for dental implants. Porcelain is used for its cosmetic qualities as well as its strength – it offers both durability and beauty for restoring damaged teeth. Porcelain looks almost exactly like tooth enamel, even reflecting light in a very similar way. 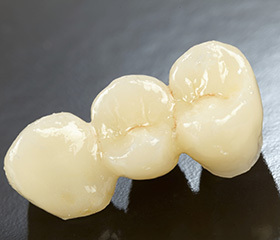 Porcelain crowns typically take two appointments: one for preparation and digital impressions, and another for placement once the crown has been created. We’ll have your porcelain crown made specifically for you at a top quality dental lab, taking great care to have the color of your crown match your smile. Don't like having impressions taken to create your new crown? At Dental Expressions you don't have to, we offer a more comfortable, more accurate and quicker way to take impressions - the iTero. The iTero machine is a digital scanner or picture taker, that we use to take scans or pictures of your teeth, and from those it creates a 3D image of your teeth. That image will then get sent to a local dental lab to create your new crown, with no big, messy impressions needed. Contact Dental Expressions near Kaukauna, WI to find out more about porcelain crowns and tooth-colored fillings. Drs. Robert and Heather Heil will make sure to thoroughly discuss your restorative options with you and determine how best to handle your damaged or missing teeth. We happily serve all of the Fox Cities, including Appleton, and Green Bay.